I was searching for a better way to program on Aria G25. I already knew cross programming in an Ubuntu environment as suggested on ACME System web site, but I prefer to use both a good IDE and a compiling on the real hardware. A very good solution is using NetBeans IDE. I'm skilled enough on it because it is the core of Microchip MPLABX IDE I currently use to program on PICs and dsPICs. It is one of the best IDE on the (free) market, available for all the platforms, full of options and plugins and, according to many users, easier to use compared to Eclipse. It	is	possible to use the full graphic environment of NetBeans connected to the Aria G25 board via an ssh connection. In this tutorial it is clearly explained how to configure it. There are different remote development modes available in NetBeans as described in this in deep article. The full remote mode is very simple to configure, just using the remote toolbar: create a remote project, all the files structure is created on Aria G25 file system and you can start developing on that. A better balanced way is the mixed or shared mode. The project is created on your computer, all the editing is performed at the maximum speed. In the building phase the project folder is mirrored on the remote board, the remote CPU compiles the source and it is executed redirecting the output to the IDE windows. But... the sharing protocols available by default on NetBeans IDE are only NFS and Samba. I prefer to use the ligther and already installed SFTP protocol avoiding other heavy installations. The required option, not enabled at default, can be added in the configuration file. 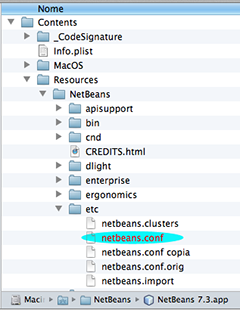 In Mac OSX it can be found right clicking the NetBeans app to show the package content. Digging some levels, you can find and edit the netbeans.conf file in etc folder. Installations on other operating systems can have a different path but the config file is the same. After restarting NetBeans two new access options are available. Choosing SFTP nothing more than standard is needed on Aria G25, the SSH tunneling is used to synchronize the project files on the embedded system. Into the home directory of the user used for login, a ".netbeans" folder is created and a folder structure identical to the computer one is mirrored.